Lieutenant Commander Trevor Leslie was born in Te Kuiti, New Zealand on 4 March 1969. He completed his secondary education at Te Awamutu College in 1986. He joined the Royal New Zealand Navy (RNZN) as an Ordinary Writer in May 1986. Between August 1986 and March 1988 he undertook general fleet training serving on HMNZ Ships CANTERBURY, WAIKATO, and WELLINGTON, being promoted to Able Writer on 11 July 1987. In March 1988 he completed the RNZN Ships Divers Course, which encompasses all basic forms of Compressed Air Diving to 18 metres. He was awarded Top Student with a pass mark of 92%. In May 1990, the then Able Writer Leslie qualified as an Assistant Physical Training Instructor from the New Zealand Army Physical Training School, and was subsequently promoted to Leading Writer on 17 August 1990. In 1991, after consolidating his basic diving knowledge with fleet operational experience, Lieutenant Commander Leslie commenced the RNZN Clearance Diver's Course. This course includes NITROX/O2 re-breather diving to 54M, Surface Supply Diving to 55M and air diving to 55M and all the relevant maintenance and theory. He subsequently transferred to the RNZN Specialist Diving Branch as a Leading Diver, which was followed by a posting to the RNZN Diving Tender HMNZS MANAWANUI as the ships diving maintainer, also completing the HELIOX 90m Bell Diving Course at this time. From January 1993 until December 1994 Lieutenant Commander Leslie was posted to the Diving School HMNZS TAMAKI as the assistant instructor for all RNZN Diving Training, completing an Analysis and Design and Instructional Technique Course commensurate with him being the primary developer for RNZN diving training. Between February and August 1995, Lieutenant Commander Leslie served as an instructor at the RNZN New Entry (Rating) School, HMNZS TAMAKI. In November 1994 he completed the Diving Medical Technicians Course in Adelaide, Australia and in June 1995 commenced his Advanced Clearance Diving Supervisors Course, thereby qualifying him to supervise NITROX, O2 and Air diving to 55m, as well as demolitions training. In January 1996 he completed the Improvised Explosives Device Disposal (IEDD) Course and since this time has been an operational IEDD Operator, to date conducting approximately 70 operational IEDD tasks. Lieutenant Commander Leslie was subsequently promoted to Petty Officer Diver on 1 April 1996. In May 1996, he was posted to HMNZS TE KAHA, the first of the RNZN ANZAC Class Frigates. He was responsible for the establishment of the Ship’s diving department, which provided the template for the future of operational diving on RNZN ANZAC Frigates. In January 1999 he posted to the Explosive Ordnance Disposal School at Eglin Airforce Base, Florida, USA and completed the Advanced Explosive Ordinance Disposal Course where he was awarded the Honour Graduate Award with a course aggregate of 97.6%. In October 1999 Lieutenant Commander Leslie completed the HSE Mixed Gas Saturation Diving Course and gained an Australian Diving Accreditation Scheme Part 4 qualification. In May 2000 he was awarded a New Zealand National Certificate in Supervisory Management and also qualified as a National Workplace Diving Assessor. This was shortly followed on 20 June 2000 with promotion to Chief Petty Officer Diver. In May 2001, Lieutenant Commander Leslie commissioned as an Officer in the Royal New Zealand Navy, graduating as top Commissioned from the Ranks student. Lieutenant Commander Leslie then posted to the RNZN College as the Diving Training Officer, being responsible for the training of all New Zealand Defence Force, New Zealand Police and New Zealand Customs Service personnel and overseas students in basic and advanced diving, supervising, demolitions and explosives training. Some notable achievements during his appointment were the certification and accreditation of the Royal New Zealand Diving School as an ADAS Accredited Training Institute, and the introduction of a New Zealand National Diploma in Occupational Diving he also introduced the Ordinary Diver Civilian Recruitment Program. He was promoted to the rank of Lieutenant on 1 May 02. In October 2002 he was appointed as the RNZN Exchange Officer at the Royal Malaysian Diving Center, Malaysia. During this time he commissioned the first RMN deep diving tender and deep diving system. His achievement of safely introducing 100M HELIOX Deep diving program and supervision of the new RMN capability of was recognized by the receipt of the Honorary Order of Chivalry to the Royal Malaysian Armed Forces and Malaysian People by the King of Malaysia. The first and (only to date) NZ Officer to receive this award. 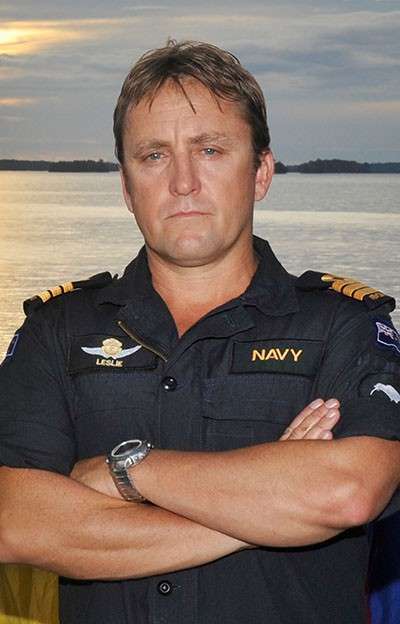 On return from Malaysia in 2005 he posted to HMS COLLINGWOOD, England for Mine Warfare Training before returning to New Zealand and became the Staff Officer Mine Counter Measures where he received into service the first RNZN Autonomous Underwater Vehicles (REMUS). June 2007 he posted as Senior National Officer for OPERATION LIMA in Southern Lebanon to conduct Battle Area Clearance to reduce the EOD remnants of the 2005 Hezbollah - Israeli war. Returning to NZ in Feb 2008 he posted to the Leadership Development Group before being posted as the Operations Officer to the Littoral Warfare Support Group, His current posting is as Commanding Officer Operational Diving Team.